Murten, a small medieval town is famous in history for the defeat of Charles the Bold (Duke of Burgundy) by the Swiss in the Battle of Murten (1476). The battle is well documented in the town's history museum. The former fortified city has kept most of its ramparts and towers, and provides for a picturesque charm. 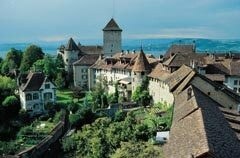 Murten is situated between Bern and Lausanne, in the Swiss "Midlands" on the edge of the Great Marsh on a gentle hill on the shores of Lake Murten. Already long ago, the Celtic and Helevetic tribes appreciated the region's temperate climate and the local countryside's particular charm, and still today, its tranquil atmosphere and mild climate lends Murten a Mediterranean feel. Numerous attractions from a significant past have been well preserved in Murten, such as the castle, the ring wall, the street scene and the arcades. The Lake Murten region is also a paradise for bikers, hikers and roller-skaters. Sports enthusiasts and families appreciate the region's changing landscapes, 170 km (106 miles) of cycling trails around the lake and across the Great Marsh, 90 km (56 mies) of roller-skating trails linking the towns of the "Pays des Trois-Lacs" (Lake Murten, Lake Biel and Lake Neuchatel), or themed trails around Mount Vully. Mt. Vully is situated on the western side of the Seeland's largest plain and the Vully vineyards take up a large part of the south face of Mt. Vully. More attractions and activities in the Murten and Lake Murten region. 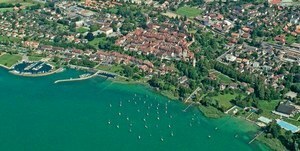 Murten is located in western Switzerland on the southern shores of Lake Murten at 453 m (1,486 ft) above sea level. The town is the capital of the Lake District of the canton of Fribourg. 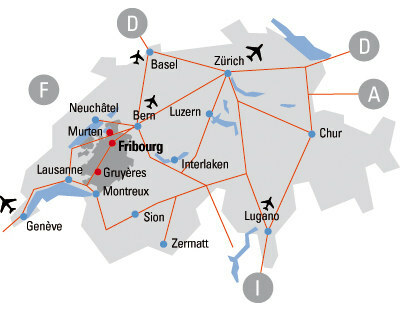 Switzerland's three major international airports, Zurich-Kloten, Geneva-Cointrin and Basel-Mulhouse are all reached within approx. 90 minutes by car or train. The regional airport Bern-Belp with some international flights is less than one hour away. Murten is easily reached by several regional trains from Bern and Fribourg (less than 30 minutes to Murten). 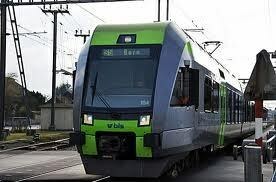 Numerous national and international trains stop in Bern and/or Fribourg where travelers need to change trains. The city of Murten is located on the A-1 motorway, Switzerland's major east-west route, and in addition, the Lake Murten - Fribourg Region is crossed by the A-12 motorway which connects Bern to the Lake Geneva Region, thus offering easy access to/from all major destinations in Switzerland and neighboring countries.